IF YOU NEED THE COUNTY ANIMAL SERVICES REGARDING A DOG OR CAT ISSUE, PLEASE CLICK ON TARRANT COUNTY ANIMAL CONTROL. Please note that the city and county don't handle wildlife issues. Animals In Attics: The most common problem that we deal with. Several species of south Texas wildlife often choose to make their home and nest inside the attics of homes. The most common culprit is the Roof Rat, which is very common. People usually hear them scurrying around at night, or see the droppings or chewing, if they happen to get inside the house. Squirrels are also very common inside attics, and are most active during the daytime, particularly morning and evening. Raccoons also often choose to live inside the attic, and will rip a hole right through the roof or into the eaves in order to gain access. We humanely trap and remove all the animals, and remove any baby animals by hand - and with squirrels and raccoons there are almost always babies. We are available 24/7 for your wildlife removal needs. Service Range: We service the Arlington / Fort Worth area, including all of Tarrant County and the towns of Bedford, Benbrook, Blue Mound, Burleson, Colleyville, Edgecliff Village, Euless, Everman, Flower Mound, Forest Hill, Grapevine, Grand Prairie, Haltom City, Haslet, Hurst, Keller, Kennedale, Lake Worth, Lakeside, Mansfield, Newark, North Richland Hills, Pantego, Pelican Bay, Richland Hills, River Oaks, Saginaw, Sansom Park, Southlake, Trophy Club, Watauga, Westlake, Westover Hills, Westworth Village, White Settlement, and more. We will travel greater distances for large jobs, such as commercial bat or rodent control. 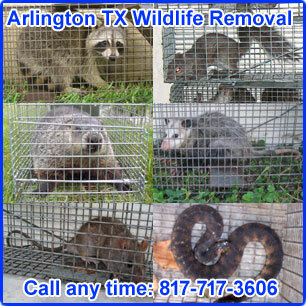 Tarrant County: We service all of Tarrant County for nuisance wildlife removal. Remember, we are a private company, and not a free service. There is no free city or county animal services that removes wild animals. The county only handles problems with domestic animals, namely dogs and cats. We don't handle problems with dogs or cats. If you have a problem with a stray dog or cat or dangerous dog or nuisance dog, call Tarrant County Animal Control at 817-451-3436. Armadillo Control: We handle problems with armadillos digging in your yard. These destructive critters can destroy landscaping or dig a big burrow next to or under your house. For more information on our armadillo trapping and removal services, visit our Arlington Armadillo Removal page. Bat Control: Bats often form large maternity colonies inside attics of homes and buildings. They can roost in huge numbers, and create odor problems and health risks with their droppings. For more information on our bat trapping and removal services, visit our Arlington Bat Removal page. Bird Control: Birds, pigeons in particular, like to roost in attics and on buildings in urban areas. They create a mess and a health risk with their nesting material and droppings. For more information on our bird and pigeon trapping and removal services, visit our Arlington Pigeon Removal page. Opossum Control: These critters are marsupials, and carry their young in a pouch, then on their back. They are nomadic scavengers, but they often choose to live under a shed or deck of a home. For more information on our opossum trapping and removal services, visit our Arlington Opossum Removal page. Raccoon Control: These critters are very strong, and are excellent climbers. They often tip over garbage cans, enter pet doors to steal dog food, poop in swimming pools, or worse than that, they often live in the attic, where they destroy ductwork and spread waste. For more info on our raccoon trapping and removal services, visit our Arlington Raccoon Removal page. Rat and Rodent Control: These animals love to live inside homes, often in the walls or attic. They are rodents, and they often chew on electrical wires. They also often break into the kitchen, and they spread filth, disease, and most of all, pestilence. For more info on our rodent and rat trapping and removal services, visit our Arlington Rat and Rodent Removal page. Snake Control: Most TX snakes are not venomous. However, if you are ever unsure about the species of snake that you see, you should leave it alone. Texas does host several species of venomous snakes. Most bites occur when people try to catch or handle these reptiles. For more information on our snake trapping and removal services, visit our Arlington Snake Removal page. Squirrel Control: This animal is an expert chewer that loves to live in the attic, where they raise 3-4 young ever autumn and spring. They can be heard scurrying through the attic and walls mostly in early morning and evening. For more info on our squirrel trapping and removal services, visit our Arlington Squirrel Removal page. Damage Repairs: Your problem won't be solved until all of the repairs are done. The reason critters got into your house in the first place is because your house had openings, or because the animals clawed or chewed their way in. Regardless, new animals will use these openings again, unless they are repaired and sealed shut. We inspect your whole home, from ground to every last vent on the roof, and find all the vulnerable areas that animals used to get in. We seal everything shut and give a guarantee against any future animal re-entry. And remember, some wildlife control jobs, such as rodent control work, can't even be performed at all until all the holes are sealed shut. Attic Cleanup: The critters living in your attic likely left a big mess up there - they drag in nesting material and food debris, but worse than that, they urinate and defecate everywhere. We clean out all of the contamination - we remove the waste and vacuum up the droppings, and we fog the attic with a special cleaner that destroys the biohazard and the odor. If you don't clean your attic, the scent of previous animals could attract new ones to the house. The droppings can grow mold over time. We leave your attic fresh and clean. Rodent Control: We are experts at south Texas rodent control, and specialize in rat removal in Fort Worth & Arlington Texas and the West Dallas area. We are a far better option than traditional Fort Worth & Arlington Texas pest control companies. They typically specialize in insect control, the use of poisons, and the art of selling customers never-ending quarterly contracts. They will never solve your rat problem. Poisons do not work! They are temporary, they never kill all the rats, new rats always replace the dead ones very quickly, and the odor of dead rat carcasses in your attic and walls is horrible. Our method is BY FAR the best and only way to PERMANENTLY solve rat problems. We stop the problem at its source by sealing off every possible entry point into your house. How to catch a Texas raccoon - You can attempt to do it yourself, but the most effective way to catch a raccoon is to have a professional do it; actually, it’s not just that it’s much more likely to be effective, it’s that most states require someone licensed to do the trapping. If you happen to have such a certificate, the best way to trap a raccoon is to lure it into a cage trap using its own young. This sounds cruel, but as long as you are sure to keep the babies protected from the weather and too much sun exposure, there is no reason for it to be considered inhumane. You’re lucky if you can find baby raccoons in the home while the mother is out. Sometimes the mother will refuse to leave the area because of her young, and then you can only snare her if you have a special pole snare. You can attempt to secure the cage trap to the exit hole on the building, intending to scare the raccoon out from inside and into the cage. When all else fails, you can set up a cage trap bolted to the roof or on the ground where you know the critter passes to get back to the home. Use marshmallows or bread as your bait. Using a meat product will only draw in other kinds of wildlife. Hello, I live in Arlington Texas and I am having a problem with Raccoons coming into my house through my cat door. I was wondering if you have any recommendations or if the only option is to trap them? Regarding the traps I am worried that my cats will be trapped as well? Please let me know the best solution (other than taking out the cat door). Also, I would like to know the cost of your services for trapping Raccoons. Thanks! My response: Rats outside - that's a tough problem. You could wrap slick metal flashing around a section of the tree, and then they won't be able to climb.